The saying's as old as human society itself. To be the king, you've gotta beat the king. New Orleans is the second team in this season's playoffs to make a run at dethroning the reigning Super Bowl champion Philadelphia Eagles. As the Chicago Bears discovered, even with the odds in their favor, it's a doinkin' challenge. At some point, you start believing that Nick Foles is some sorta warlock or something. Bovada isn't into the supernatural. 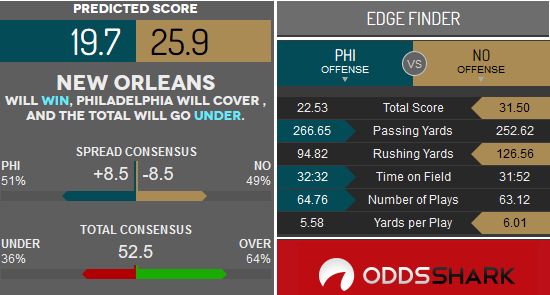 It's set the line at New Orleans -9 with the total at 53 and the moneyline at Philadelphia +310 and New Orleans -420. Because they're harder to kill than Rasputin and party like him when they survive. With Foles at the controls, it seems like an exercise in futility to analyze the Eagles. They needed a miracle in Chicago, and who'd expect a fate-sealing chip shot by the home team to doink them to victory last weekend? And yet, the data's indicating the clues are there. Philadelphia turned its season around after the Saints smacked them down, 48-7, by winning five of its final six regular-season games. The Eagles continue to get the job done as underdogs, going 5-2 SU and ATS in their past seven while carrying that label. The Saints make the Superdome is one of the toughest places to play in the NFL, as evidenced by their winning 14 of their last 16 there. Furthermore, dudes are 5-0 at home in the playoffs since Sean Payton took over as head coach in 2006. Drew Brees is having another legendary campaign, and when he zones in, the New Orleans offense is virtually unstoppable. On the other side of the ball, the Saints' defense has been aggressively grudging. It all added up to a 13-3 season that's an accurate reflection of their accomplishments. If ever a game had intangibles that just can't be ignored, it's this one. The Eagles are a much different team now than when they were in disarray the last time these two clubs played. And with Foles at the helm, go figure. Stat-wise, check this out: In the past four meetings between the Saints and Eagles, the under is 3-1 with an average combined score of 50.5 points. The Saints have also gone below the closing total in five of their past seven in Louisiana with an average combined score of 42.1 points. This is a time to play both the intangible and the trend.